Ocean Refit’s restoration of S/Y Tern wins award! 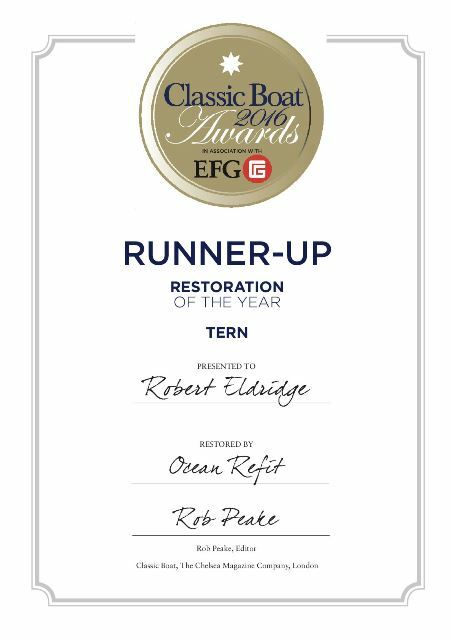 The readers of UK’s CLASSIC BOAT magazine have voted for Ocean Refit’s restoration of S/Y TERN as the runner-up in “Best Restoration of the year” category of their prestigious annual awards! MARY ROSE, NG Herreshoff, 1920. Restored by LMI and Crabbs. HUFF OF ARKLOW, Uffa Fox / John Tyrell, 1951. Congratulations to Tecnomar and Enrico Zacagni, whose thorough restoration of the stunning 10m class, MARGA, won the first prize!